I do have some excuses. I have been under doctors care for Depression and Anxiety, also had a Stress Test and then a Heart Cath (hospitalized for test), then had cataract surgery, and then another hospital for a D&C. In between my back and hip and shoulders are getting more painful which means more shots as needed. Other than that I am at least glad that even in March when I only read one book, it was one that was almost 600 pgs and at least I didn't have a month with no books at all! Of course there were many good reads! The Immortal Life of Henrietta Lacks by Rebecca Skloot is probably one of the most interesting. A black lady dying of cancer and cells are taken in hopes to help find a cure. For some reason the cells never died as others always did and were used all over the world to help find cures, yet the family never knew this nor did they receive a cent from it all. I went back and read two of the Piers Anthony Xanth books which I read eons ago for some enjoyment. I read some Biographies and Autobiograpies such as Walt Disney, Charlton Heston, Judy Garland & Eleanor Roosevelt. But of all the books, I guess the "one" I would say was the best was: Letters from Skye by Jessica Brockmole. For some reason I had a hard time setting the book down when my eyes just couldn't read more. And the moment I thought they could read more... the book was back in my hands! I also read The Thirteenth Tale by Diane Setterfield for the 3rd time. Guess you'd say I like the book...you'd be right! Looking over my list I did manage to read quite a few female authors! I never really care if the author's are male or female..but the list makes it obvious! Now it's your turn to tell us how your year in reading went! 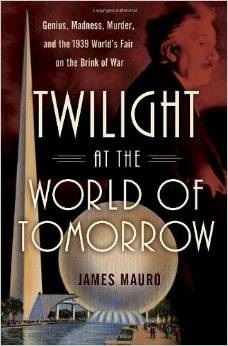 Twilight at the World of Tomorrow by James Mauro. The summer of 1939 was an epic turning point for America—a brief window between the Great Depression and World War II. It was the last season of unbridled hope for peace and prosperity; by Labor Day, the Nazis were in Poland. And nothing would come to symbolize this transformation from acute optimism to fear and dread more than the 1939 New York World’s Fair. A glorious vision of the future, the Fair introduced television, the fax machine, nylon, and fluorescent lights. The “World of Tomorrow,” as it was called, was a dream city built upon a notorious garbage dump—The Great Gatsby’s infamous ash heaps. Yet these lofty dreams would come crashing down to earth in just two years. From the fair’s opening on a stormy spring day, everything that could go wrong did: not just freakish weather but power failures and bomb threats. Grover Whalen, the Fair’s president, struggled in vain to win over dictators Benito Mussolini and Joseph Stalin, believing that his utopian vision had the power to stop their madness. And two New York City police detectives, Joe Lynch and Freddy Socha, who had been assigned to investigate a series of bomb threats and explosions that had terrorized the city for months, would have a rendezvous with destiny at the Fair: During the summer of 1940, in a chilling preview of things to come, terrorism would arrive on American shores—and the grounds of the World’s Fair. Yet behind this tragic tableau is a story as incredible as it is inspiring. With a colorful cast of supporting characters—including Mayor Fiorello La Guardia, Robert Moses, and FDR—Twilight at the World of Tomorrow is narrative nonfiction at its finest, a gripping true-life drama that not only illuminates a forgotten episode of the nation’s past but shines a probing light upon its present and its future. This book is one of the thrift shop books... as the covers says: " Genius, Madness, Murder, and the 1939 World's Fair on the Brink of War" So I took it home. I knew it was a true story and that I wasn't yet born and 1939 was really the brink of war, a time I seem to like to read about so it had to be good. Eh... not bad .. interesting, lots of names I remember hearing of like, Einstein, Stalin, Franklin Roosevelt etc. It spoke of the idea of the Worlds Fair, how it finally got going, getting companies and countries to want to have space at the fair ..although the book was not one that I couldn't wait to pick up again.. it was good enough to read it fairly quickly and I learned something I really had not heard of and that was the bombing that happened at the Fair in which 3 bomb squad men got killed... and the inclinations of hatred towards the Nazi's. (I knew of the hatred.. just learning about when it first began). I also was unaware that it was Einstein who brought to light that the Germans might be making atomic weapons and wrote to Roosevelt... thus was the beginning of the making of the Atomic Bomb. So there definitely was a learning curve to this book. And true stores about certain times in history always have background information that I find very interesting to learn about. This is probably not the book for everyone.. but it is a piece of history if one wants to know about the 1939 World's Fair. 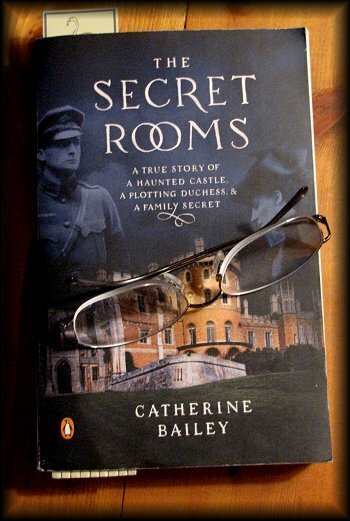 The Secret Rooms by Catherine Bailey. This was a pretty good read. It's true life "history" with mystery involved. It was a little long in the tooth when it came to describing parts of the war that the Duke was in .. although through letter and such everything told was in fact truth... just a bit of it was boring to this old woman. That being said, the bulk of this book held my interest and I find my interest in history rises as I grow older. Although this is the story of one man, the 9th Duke of Rutland, there is always the background (other people and places) that remind you that it is not the present that's being talked about. Yup... give me a castle and I will probably want to read the story! I think I like mysteries.. in fact I am certain of it lol. This one, as many I read, takes place in England. It is called "book 2" but in honesty I had no problem following the character or anything going on so I am saying I had no problem reading this as a stand alone book. 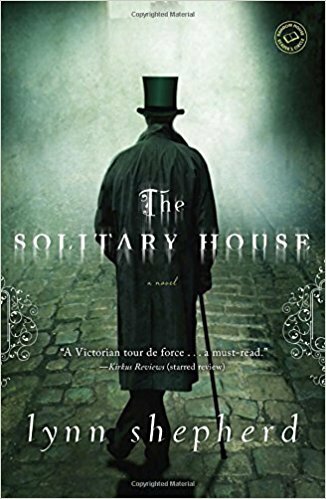 The booklist review is good... the book does have many touches of the very down trodden London area where the Ripper once did his slaughters. Some similarities to be sure but the characters and story held it's own no matter what. This is a good read if one likes detective, murder, and mystery back in the Dickens days of England. I found another book using the same Detective Maddox in the used books and sent for it.. so I must have liked this one well enough eh?! I really should have read this sooner. Excellent book. Slavery is definitely not my most favorite topic, but being that this story begins in 1791... it is also history, which I do like reading about. In this book you get to meet the families that "adopt" a young white girl and accept her as their own. As awful and as hard as much of this story is, it is also about family and love and what's most important in lives even back in 1791. There wasn't any great mystery, and part of this book are very sad. But it was a very good piece of historical fiction. And I found none of it to be "unbelievable". The accents and language used back then is throughout the book, so to some they might not like that.. I found it to make the story more believable. All in all.. a heartwarming story. Both happy and sad. Pretty much what could be said about life even now. 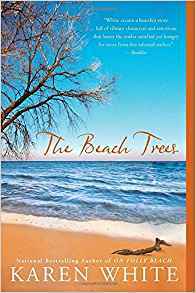 The Beach Trees by Karen White. This is the third book I've read by this author. The first was "On Folly Beach", which I enjoyed. I also read, The Lost Hours by her. I didn't search Karen White out for this book, but when I came across it and remembered her other books were enjoyable I brought it home with me. (thrift store of course). 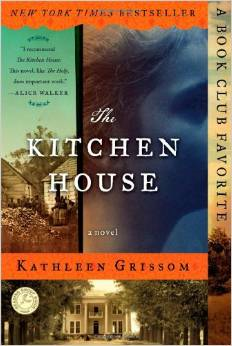 I do rather enjoy books that have long time secrets and mysteries surrounding them... and this one didn't disappoint. Most of the books I read happen either in England or Scotland it seems but this one revolves around Biloxi Miss. and New Orleans, after the time Katrina had devastated the area. After reading the book I can say I felt I had "visited" the area. There was some good history in the story and even a town named Metairie LA, where my "adopted son", Chris lives. 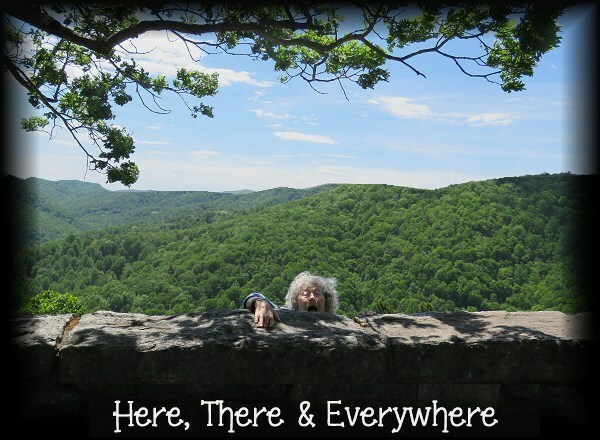 I love reading books that talks about towns where I have never been but have computer friends living there. Anyway.. this was an easy to read book, kept my interest , and I am sure sometime along the way I will wind up reading yet another book by Karen White.